Time series momentum is an asset-pricing anomaly in financial markets that was only recently documented by academia. It’s a time series phenomenon that is found to be present in different asset markets (equities, commodities, fixed-income, and currencies). Research found that exploiting this anomaly tends to generate strong risk-adjusted returns. What’s particularly interesting about time-series momentum is that profits from the strategy are positive not just on average across the assets, but for every asset. While momentum in the cross-section of asset returns is well-known and has been studied thoroughly since it was first described by Mark Carhart in the mid 1990’s, time series momentum is quite novel. Since the introduction of time series momentum we should specify the type of momentum we refer to when we talk about ‘momentum’. In particular, we should distinguish between cross-sectional momentum on the one hand and time-series momentum on the other. The first type of momentum, and by far the most well-known, is momentum in the cross-section of asset returns. Often, when researchers or practitioners are discussing ‘momentum’, they are almost univocally referring to cross-sectional momentum. As its name suggests, this type of momentum relies on ‘momentum in the cross-section’, i.e. comparing the performance of different stocks available for investing at the same time. Putting a ‘traditional’ cross-sectional momentum strategy into practice consist of sorting all the currently available stocks in 10 deciles based on past 12-month performance (excluding the last month). The second step requires constructing a zero-investment portfolio by selling the bottom decile of worst performing stocks, and using the proceeds to buy the top decile of best performing stocks. The strategy is profitable when the top decile outperform the bottom decile, i.e. when the ‘winners’ (top decile) outperform the losers (bottom decile). Once a month, this process repeated. The returns from this long-short portfolio have been found to be largely unrelated to market returns or the returns of other well-known anomalies. We should note however that, recently, some research emerged that suggests that cross-sectional momentum tends to break down for extended periods of time. ‘Momentum crashes’ as these episodes are called, refer to periods in time where the ‘losers’ actually tend to outperform the ‘winners’. This seems to be the case after a severe financial crises. After such events (e.g. the great depression and the recent financial crisis), the ‘losers’ tended to rebound more quickly than the ‘winners’, temporarily making cross-sectional momentum unprofitable. In recent years a number of researchers have documented a second type of momentum in asset prices. This type of momentum does not depend on ‘winners’ outperforming ‘losers’. Instead, it simply requires a continuation of the price direction of the security. As such, time series momentum relies on the observation that a security’s own past return can be predictive of its future performance. To some extent, putting a time series momentum strategy into practice is similar to applying cross-sectional momentum strategy. 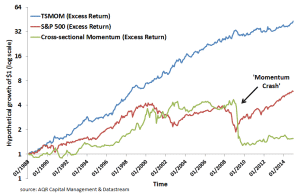 A simple time series momentum strategy also uses a 12-month time-frame to determine past performance when implementing the strategy. However, instead of sorting the securities based on their performance, we instead take a position in every security. Securities whose cumulative past performance was positive in the past 12 months are bought, while securities with negative past performance are sold. Where is rt-12,t the return over the past 12 months and rt,t+1 is next month’s return. The formula dictates taking a long position when sign of the cumulative past 12-month returns is positive, and a short position otherwise. The fact that time series momentum evaluates momentum on a security-by-security basis implies that it is possible to be short all assets, or be long all assets at the same time. This is not possible in the case of cross-sectional momentum, which relies on ‘winners’ outperforming ‘losers’. While time series momentum can be applied to a single asset, it is advisable to apply it to a universe of securities. The larger the universe of assets, the larger the diversification gains. While time series momentum at the level of any single asset might be small and difficult to capture, applying the strategy to a large universe of securities is shown to work. A diversified portfolio relying on time series momentum strategies across different asset classes is shown to consistently deliver large and significant abnormal returns. 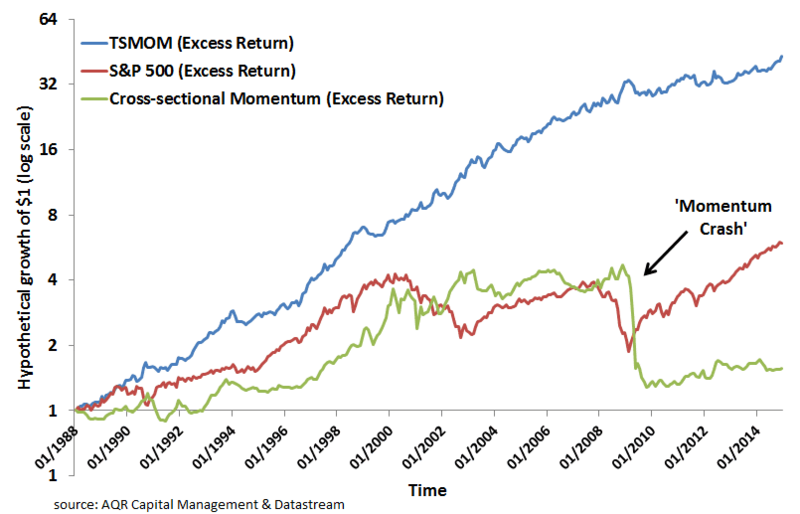 Moreover, time series momentum returns appear to be strongest when stock market returns are most extreme. In that sense, time series momentum does not suffer from momentum crashes. Time-series momentum is a recently proposed absolute momentum strategy that exploits autocorrelation in the time series of securities’ prices. The term was first introduced by the AQR Capital Management LLC.